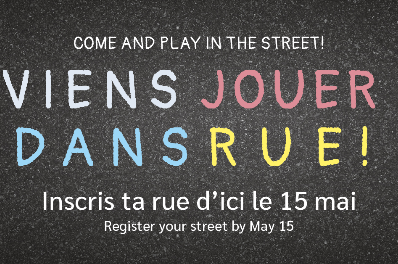 Earlier today, the Town of Rosemère launched a new initiative known as Come and Play in the Street! to encourage children to put down or turn off their electronic devices and build real-life friendships with other young people in their neighbourhood. Before you start filling out a nomination form, make sure your street is eligible and meets the designated selection criteria. A map of ineligible streets can be found here. If your street is eligible, you have until May 15, 2019, to return your completed nomination form to the Town, signed by five different homeowners from your street. Selected streets will have to abide by a Code of Conduct while the pilot project is underway, i.e.,between June and September. This includes a reduced speed limit of 15km/h. For additional information, go to the Town’s website.